All you want is a funky rock ‘n roller? Look no further…New Politics is all you need! The alternative/rock/pop trio from Copenhagen, Denmark might be few in members, but it is HUGE in sound! They are definitely one of my favorite current bands and I was so excited for the release of their second album, A Bad Girl In Harlem. It may not be as raw as the first self-titled album, but it is filled with catchy hooks and a little something for everyone. The first single released, “Harlem”, is easily my favorite track on the entire record. With it’s “My Sharona” drum beats at the beginning and the energy that never lets up, you can’t help but dance and sing the lyrics at the top of your lungs. From the more poppy tracks like “Fall Into These Arms” and “Tonight You’re Perfect”, to the ballady “Stuck On You”, and the inspirational “Overcome”, this album offers a little bit of everything. “Die Together” sounds very Muse-esque and “Just Like Me” is more punk…yes, this album seems to be all over the place, but that’s one of the things I like most about it! No matter what kinda mood you’re in, they have a song to fit. Props to the boys, David Boyd, Søren Hansen, and Louis Vecchio, for a solid sophomore album and I know they will be around for a while. 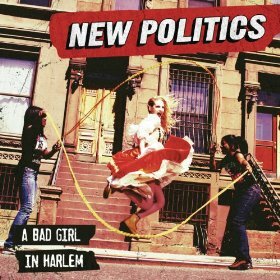 Pick up A Bad Girl In Harlem ASAP, and if you haven’t seen New Politics live, do yourself a favor…their shows are a very high energy, non-stop party, and David’s breakdancing skills are out of this world! Catch them on tour this summer with Fall Out Boy and Paramore!